Welcome to the RWBY RPG! If you're having any trouble on getting started, then look no further, this guide should answer your confusion to how to start roleplaying here. First off, everyone should read the rules, even if you know how to get started, everyone should read them at least once. After you have copy and pasted the coding into the notepad file, save it somewhere secure so you won't lose it. After saving the file, fill in the sections. Remember, the more detailed, the better. 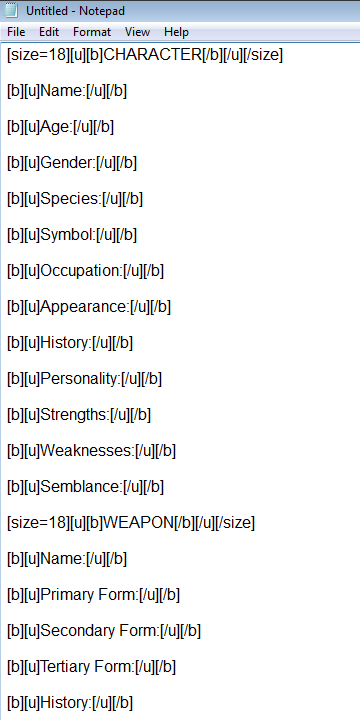 There is also information about creating a character in the character template and rules threads, which you should have read earlier, this will help you complete the character. 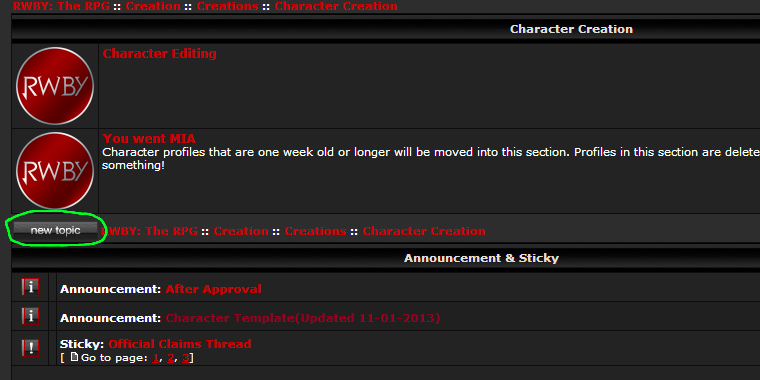 Once you have filled out the character template, you should head over to character creation thread, this is where your filled out character template has to go so it can be approved. Once your character has been put up for approval, you need to wait until two different moderators and/or admins have given you two approvals, if there is something that needs fixing or breaks the rules in your character, the moderators or admins will point it out to you in a post so that you can fix the problem and get the character approved. 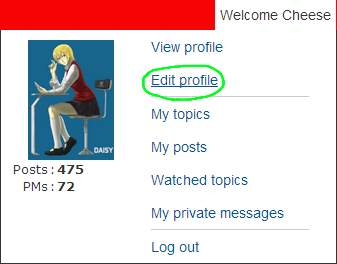 After you have gotten two approvals by the moderators or admins, you will need to add your character to your signature, this should help people you're roleplaying with determine which character you are using, this guide shows how. Once you have finished all of the above steps, you're ready to start roleplaying! There are three basic types of threads, [OPEN], [INVITE], [CLOSED]. There are a few more, but these are covered in the rules thread as they don't need extra guides on how to join as they are joined in the same was as the three mentioned earlier. Closed thread authors either pre-determine which characters are going to be in it, either via chatbox or private message, or they can set up a thread signup thread, these signup threads are found in the plot zone thread.